What begins as a conventional search for conman Binnie Varshun (on behalf of defrauded aristocrat Diomedo Obron) takes a brief, unpleasant turn when Kaslo is overpowered and enslaved. Kaslo, who is the sort of cautious, well-prepared Galactic Op who can overcome a small army of opponents in a cut-scene, leaves his captors vanquished or in chains The case seems successfully resolved. The sensible course of action for Obron is to pocket whatever funds Vashun has not spent, then enjoy the prospect of the scalawag’s long stay in a contemplarium. Inexplicably, Obron elects to employ Vashun again, this time under Kaslo’s close watch. It is an odd decision but Obron’s money is good. Kaslo is willing to go along. Obron and his rivals share a curious delusion: that the universe cycles between eras in which science and reason rule and ones in which magic holds sway. The age of reason, they believe, is about to end and in the new age of magic, wizards—people who like Obron have a gift for magic—will rule. The rich, of course, can afford to indulge any number of absurd beliefs. Kaslo is a practical man and he prefers to focus on keeping his eccentric patrons alive, or failing that, at least collecting his fee. Alas for the practical man, the would-be wizards are correct. Indeed, the age of magic is not merely impending, it manifests. Sad news for humanity’s technology and all those dependent on it. Kaslo is canny enough to survive the disaster but he has absolutely no gift for magic. What role for the practical man in a universe ruled by wizardly whim ? Normally, I try to keep my vocabulary gender neutral. I can use male pronouns without stint in this review, because none of the significant characters in the book are women. This in a novel published in 2016. The author asserts that women can wield magic as well as men, but employs them only in supporting roles. This is set in Hughes’ Archonate Universe, the same universe in which The Compleat Guth Bandar and Black Brillion are set. Hughes has been writing stories set in this universe since 1994; the notion that the Age of Reason was about to come to a crashing end has always been present. This is the novel in which the author finally pulls the pin on that particular grenade. There will be a social collapse. Technologies will fail. Then out of the wreckage will arise a new age, ruled by those who have the gift, and especially those who have the willpower, to comprehend and use magic. Some, like Earth’s Archon, try to mitigate the scale of the disaster. Others, like Varshun, plan to exploit it. Mere mundanes will be doing well to simply survive; most do not. Providentially, not only is Kaslo cunning enough to survive the short-term consequences of the great change … not only is he canny in his choice of allies … but he’s sufficiently focused on personal survival that he is not traumatized by the horrific loss of life around him. Not that he won’t help others if it’s a practical option; he’s not a complete monster. He can be quite likeable, in his formal way. He’s just… very clear about his priorities. One notes that the more overtly ruthless the character, the more naked their grab for personal power, the more dismal their fate. It is almost as though the author was trying to make a point. Although the setting was never Utopian and the personal stakes for characters were always high, the Archonate books have generally leaned more towards the cheerful (or at least sardonic) than grim. This is something of an exception. Other authors might decide to present the deaths of billions of people as amusing or even a positive good (feel free to provide examples in comments!) but Hughes does not. The end of Reason may be an opportunity for a few but for most, it’s a horrific calamity. 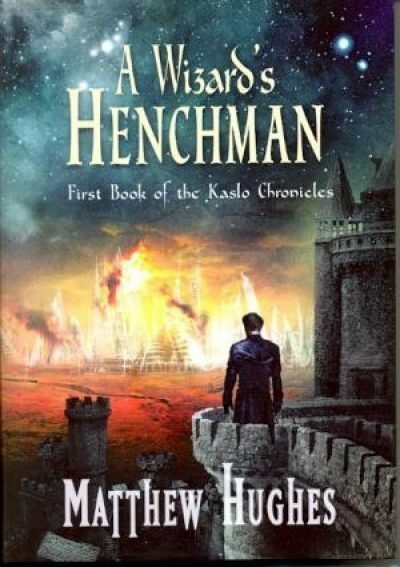 A Wizard’s Henchman is available here.